e-Discovery remains a top driver for investment in archiving technologies. The need to reduce legal cost and risk is growing. But meeting e-discovery and compliance demands quickly and defensibly is difficult for most organizations. 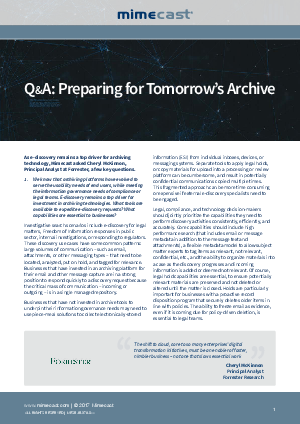 This short Q & A, “Preparing for Tomorrow’s Archive?” features Forrester’s Principal Analyst, Cheryl McKinnon and will help you understand the key features you should look for when planning your litigation readiness strategy.